The weekly club fly started out to be somewhat “iffy”. Chilly, gray, foggy. But we few intrepid flyers showed up at the beach with the intent of putting color in the sky no matter what.The winds ended up being stronger than expected which cleared away the fog and the clouds and made for a beautiful morning. The temperature warmed up nicely. I grabbed a couple of kites I hadn’t flown in a year or more; a Willi Koch mesh diamond by Premier and the HQ vented Obsession II dual line stunt kite. When we got down to the beach I found I also had two Sutton 4s in my backpack. So I ended up having a slightly larger display than I thought. A good friend put up his HQ Flowform 7.0 and added a couple of spin socks to the line. 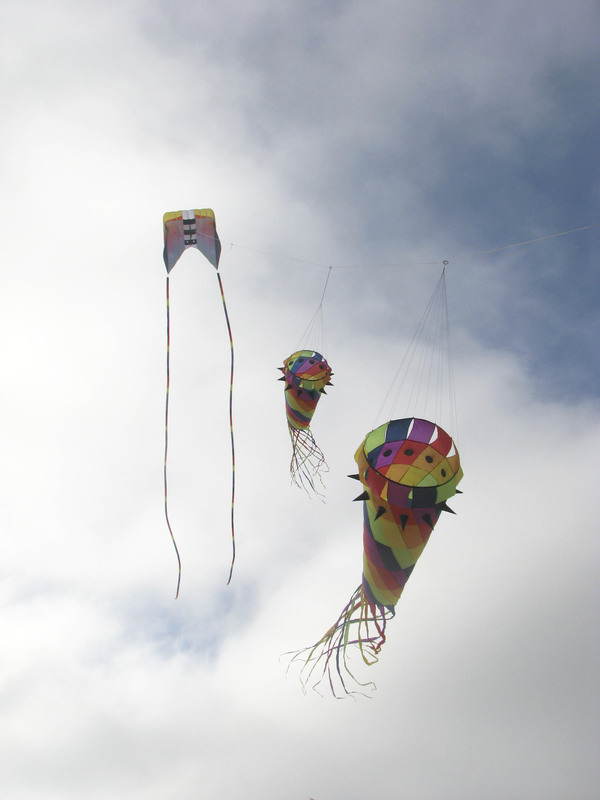 This kite was visible in the sky several miles away to motorists passing by. Then he attempted to fly a Toki Edo kite by Into The Wind. 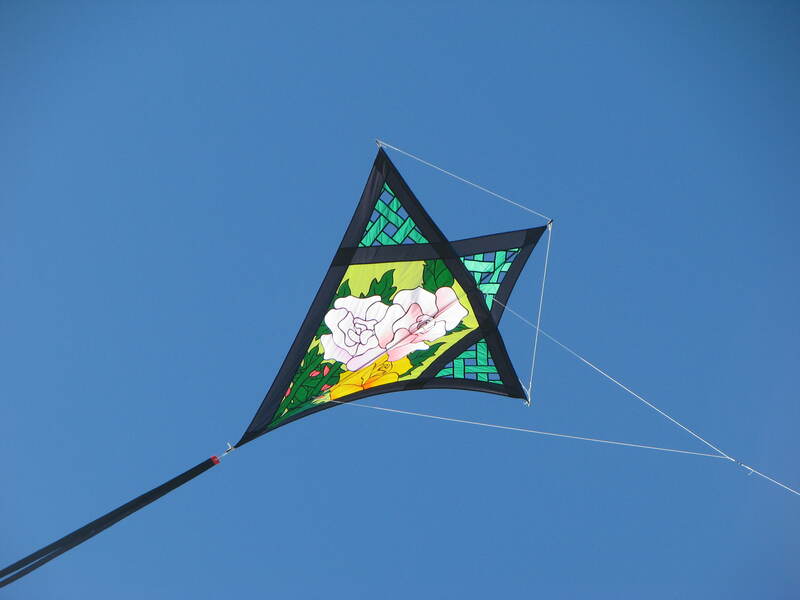 It’s a beautiful kite made as a traditional edo but with flat fiberglass spars. It take s a while to assemble as the spars are held together flat metal ferrules, screws and wing nuts. And then there is the bridle. It has thirteen lines and is rather long. The majority of the morning was spend untangling it. After several adjustments to the kite, it flew and flew quite well. 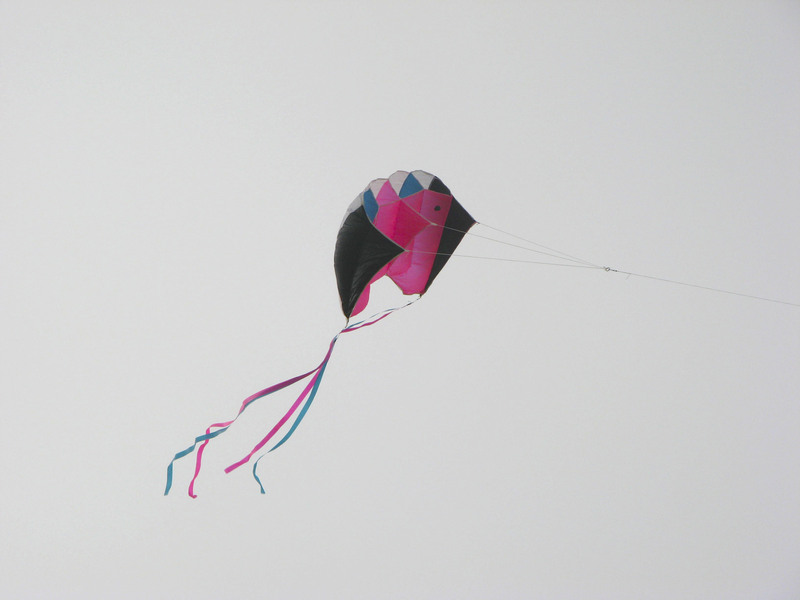 It is a beautiful kite. 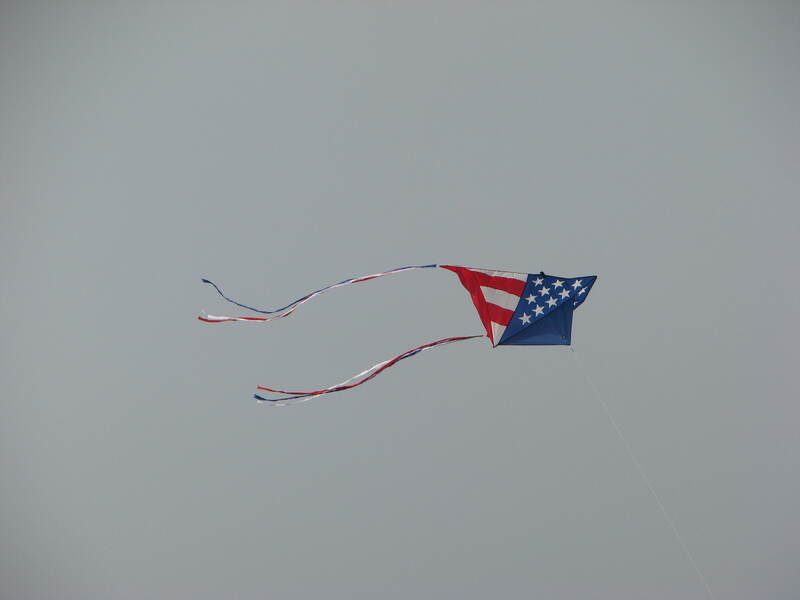 Another kite in the sky was the red-white-blue Levitation Delta. It provided a some excitement. While everyone’s attention was on the edo, a gust of wind pulled the stake that the delta was tied to out of the ground. 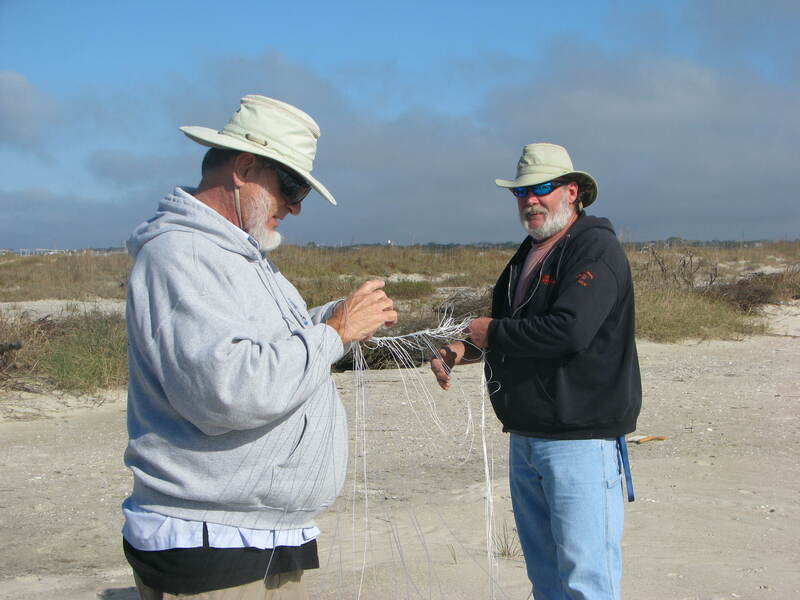 Five hundred feet of line unwound from the spool and it bounced down the dunes until it caught on a dead tree branch. I was checking on my mesh diamond when I noticed the speck above in the clouds. We were lucky it caught on the branch and that the line was tied to the spool. It takes quite a while to rewind 500 feet of line. We never did find the stake. 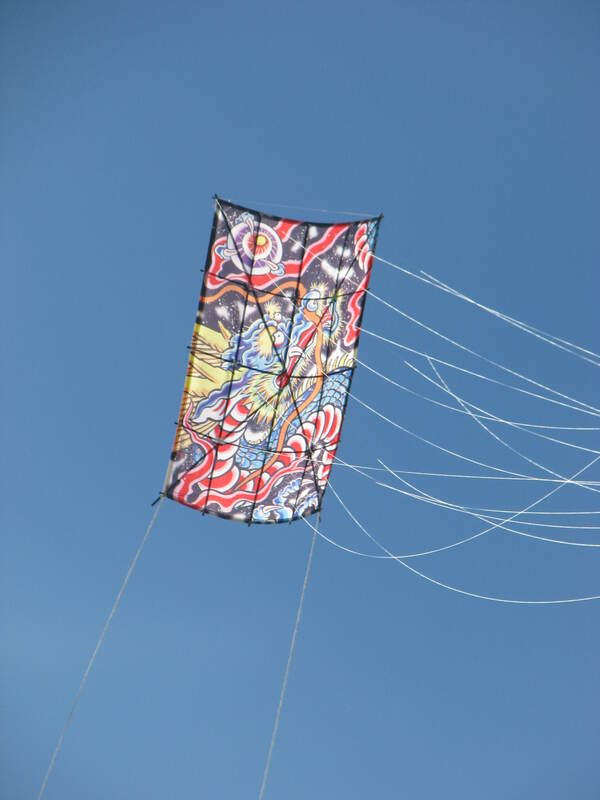 To complete the show, the most unusual kite in the air was a custom Flake kite. 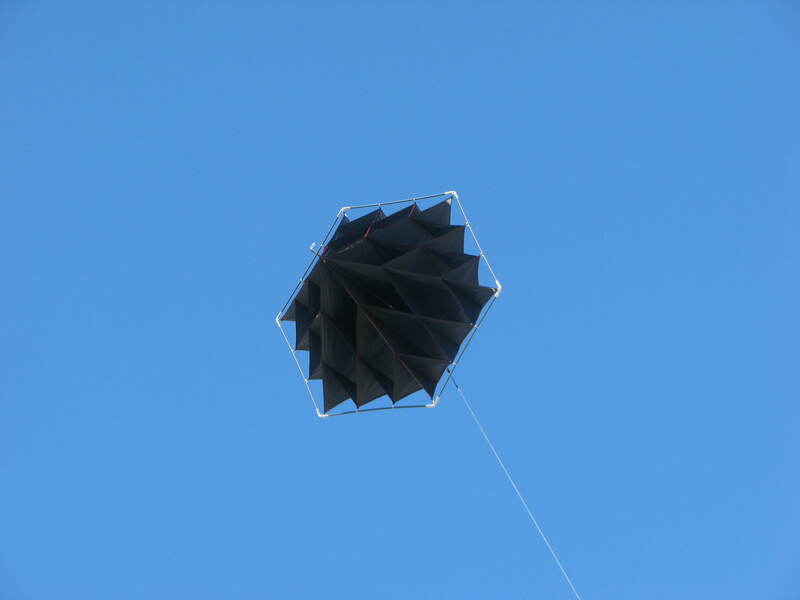 It is a multi-faceted cellular kite that loves bigger wind. In this case, it is all black and one-of-a-kind. It was made by Jeri Dixon at Kites Unlimited kite shop for a good friend of ours. Rumor has it that she is making an all white one for him too. We’ve decided he has a sort of ying-yang thing going on. Can’t wait to see both of them flying side by side. 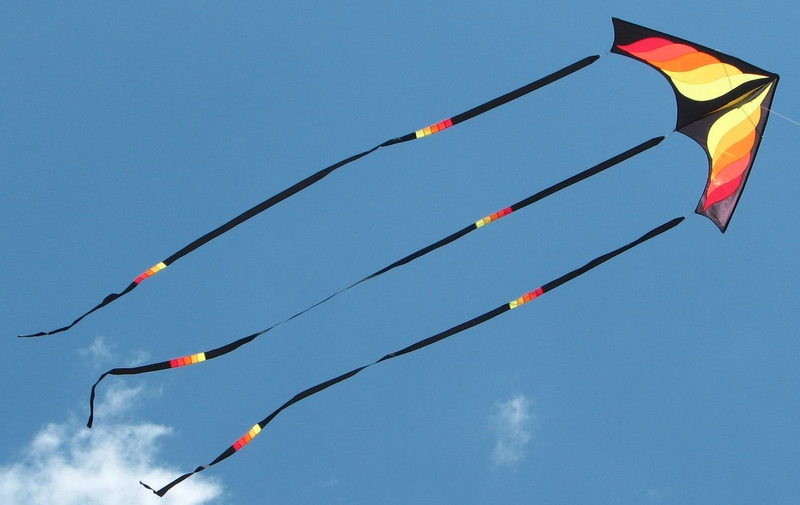 I never did get the stunt kite in the air. Oh, well! It was a beautiful morning and the company was good. What more could you ask for? 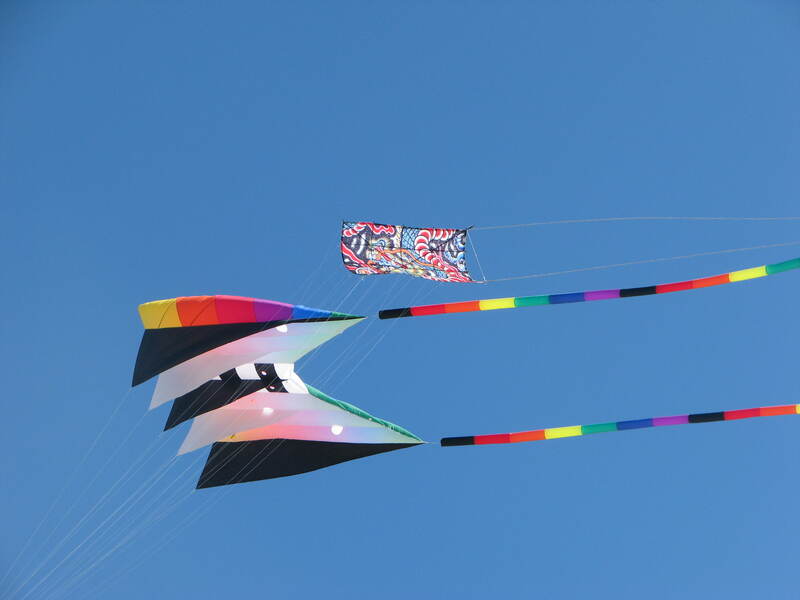 Wow, love the photos of the unusual kites.